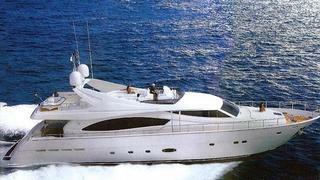 Jeff Stanley at Gilman Yachts tells me he's sold Ferretti’s 25.8m motor yacht Princess Jules to a direct client. Built in 2005, Princess Jules features twin 16V2000 M91 2,000hp MTU diesels with only 500 hours on them, powering her to a top speed of 30 knots. Accommodation includes a mid-ship master suite with a fully walk-around king-sized berth plus three other suites and crew accommodation for up to four. A fold-down ‘teak beach’ also stows the yacht’s wave runner, allowing plenty of room on the flybridge for a tender and hot tub. Princess Jules was asking $2.75 million.